Well. I have a confession to make. Awhile back I loudly proclaimed that I had the World’s Greatest Waffle and Pancake recipe. But I now realize that I might have spoken too soon. So I would like to amend my claim and say that it was the World’s Greatest Almond Flour Waffle and Pancake recipe. The difference is that I didn’t know about Carbquik Baking Mix back then. But now I’ve experimented with the mix and come up with a delicious low carb blueberry ricotta pancake recipe. These pancakes are light and fluffy and full of juicy blueberry goodness. They are the closest I’ve come to low carb pancake perfection. Plus, they have only 4g net carbs per serving. Not too shabby. But again, apologies for the confusion. Please enjoy the new World’s Greatest Pancakes. These are hands down the World’s Greatest Low Carb Blueberry Ricotta Pancakes. No question. 1. Add eggs, ricotta cheese, almond milk, and baking mix to a blender and blend until combined. Scrape down the sides to get any pockets of baking mix and blend again. 2. Heat butter in a large skillet over Medium High heat. Pour the batter onto the skillet in 1/4 cup measurements. 3. Place blueberries evenly over the batter. Cook until bubbles form in the batter, 1-2 minutes. Flip pancakes and cook until browned, 1-2 minutes more. You should have 8 pancakes. 4. Serve topped with butter and sugar-free pancake syrup. If you liked these pancakes, then you might like my recipes for regular waffles, pumpkin waffles, and banana walnut waffles. I love easy recipes like this one. 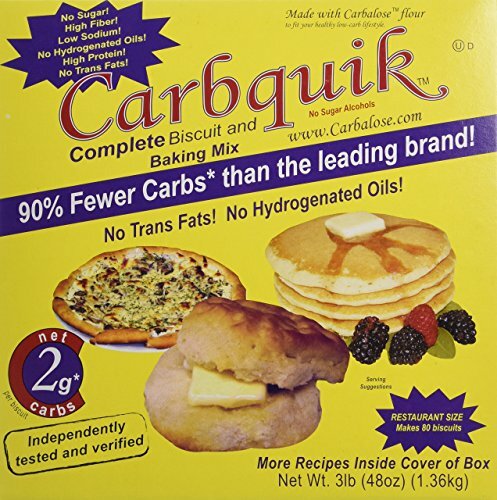 I will definitely order some Carbquik so I can try it. It’s so good. It’ll be your pancake go to, mark my words.